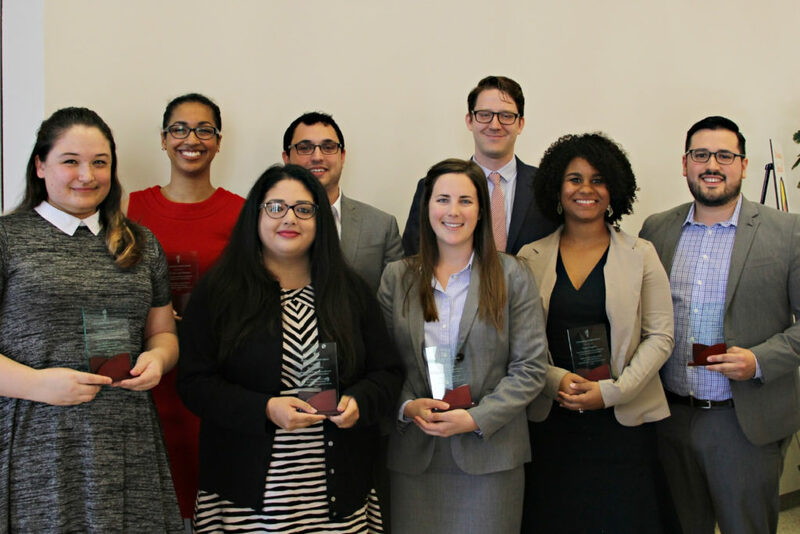 Eight third-year students at The University of Texas School of Law have been honored by the William Wayne Justice Center for Public Interest Law with Graduating Student Awards. This annual award recognizes graduating students for their extraordinary commitment during law school to using the law to serve others. The faculty selection committee considered the applicants’ work in the public interest, pro bono, government, legislative, and other nonprofit sectors, as well as participation in law school clinical courses, pro bono projects, and student groups. At least one award specifically recognizes commitment to pro bono activities and at least one award specifically recognizes commitment to government service, in addition to other service. Dean Ward Farnsworth and Eden Harrington, the director of the Justice Center, presented the recipients at the Law School’s annual Ice Cream Social/Celebration of Service. Paige Duggins was president of Texas Law Fellowships, and a Pro Bono Scholar with the Mithoff Pro Bono Program focusing on educational equity. She was community service chair of the Thurgood Marshall Legal Society and a Teaching Quizmaster. She participated in the Law School’s Civil Rights Clinic. She interned with the Texas Civil Rights Project, Texas RioGrande Legal Aid, and the Mexican American Legal Defense and Education Fund. Anya Morgan was a founding board member of the Texas Chapter of the National Lawyers’ Guild and pro bono director of OUTLaw. She was a board member of Getting Radical in the South (GRITS) and president of the Texas Law Yoga Club. She interned with the Sylvia Rivera Law Project in New York and the Texas Civil Rights Project. She participated in the Civil Rights Clinic and the Domestic Violence Clinic, and helped lead pro se clinics for the Law School’s Trans Name and Gender Marker Project. Briana Perez interned with the Mexican American Legal Defense and Education Fund in San Antonio, the Texas Civil Rights Project, and the ACLU Immigrants’ Rights Project in New York. She participated in the Law School’s Civil Rights Clinic, the Human Rights Clinic, and the Immigration Clinic. She was secretary of the Chicano/Hispanic Law Students’ Association for two years. Lochlin Rosen was a project manager for the Juvenile Lifers Project as a 1L and a Pro Bono Scholar with the Mithoff Pro Bono Program as a 2L. He was a co-director of Getting Radical in the South (GRITS) and president of the Public Interest Law Association. He interned with the International Criminal Tribunal for the Former Yugoslavia, the Public Defender Service for the District of Columbia, and the Texas Defender Service. He participated in the Capital Punishment Clinic and the Criminal Defense Clinic. Alex Stamm helped draft the Civil Rights Clinic report on deaths in Texas jails. As a student in the Criminal Defense Clinic, he tried a case and won a not-guilty verdict. He interned with Texas RioGrande Legal Aid, the Public Defender Service for the District of Columbia, and the Texas Civil Rights Project. He was associate editor for the Texas Law Review and a Teaching Quizmaster. He is a class of 2017 Chancellor.